Microsoft executive has confirmed that the company’s business is effectively turning its back on the progression of Windows 10 Mobile. Head of Experience at Windows, Joe Belfiore, took to Twitter over the weekend to inform that his company will continue to support the platform going forward, but also confirmed that progressing it and pushing it forward isn’t currently on the horizon anymore, at least not at the moment. The internal decision taken by Microsoft is clearly down to the fact that the company has massively struggled to make any significant dent in the smartphone market, and has all but failed to actually take any market share away from iOS and Android. As of today, Windows account for a relatively paltry 1.3% of the United States smartphone market, which doesn’t actually make it the least consumer supported platform (that title belongs to BlackBerry), but does make it difficult for the financial gatekeepers at Microsoft to continually release budget to support and grow the platform. Belfiore’s tweet confirmed the news that Microsoft simply doesn’t intend to go down the route of building new features into Windows 10 Mobile, and certainly doesn’t have any immediate plans to start introducing new hardware to the market. It feels very much like the Windows-maker is shutting down shop while the relevant departments and figureheads try to ploy which direction to go in next. 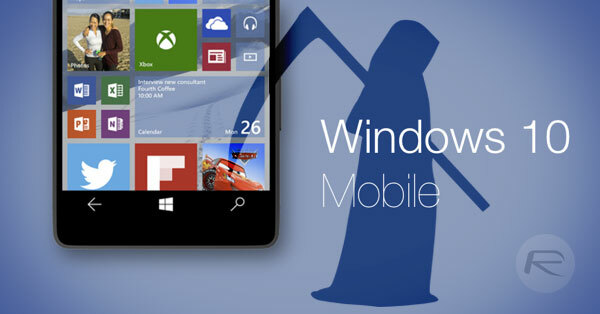 Of course, while that’s happening, the company will continue to ensure that Windows 10 Mobile is kept up to date with bug fixes and security improvements as part of an effort to support those who are still using the platform. The purpose behind Windows 10 Mobile was to try build and offer a converged and truly jointed experience for those users who wanted to switch between multiple different device and hardware types. We aren’t exactly sure if Microsoft is plotting internally for the revival of the platform, or if this is just the first nail in the coffin, but Microsoft’s public display of no-confidence in the platform is likely to ensure that those who are currently using it, take the earliest opportunity to move away to iOS or Android. That could spell the end of the road. It’s also perhaps worth noting how 7 years ago Microsoft infamously held a funeral for iPhone with the arrival of Windows Phone 7 Series. Today, the company effectively killed its own platform for good. I think they need to work on some kind of software emulation so that they can bake x86 compatibility allowing Microsoft to offer true convergence between mobile and desktop. Otherwise they have no play in the mobile market. Yes, I agree with you. They should focus on the niche of converging platform as have been intended but pushed down the ownership cost. The like of pocketable HDMI-port smart devices have grown well lately (chromecast). The like of such convergence (Ubuntu) failed before launch because the ownership cost is too high, but Microsoft has the capabilities and means to do so for reasonable price to produce. Belfiore also confirmed that just like Gates he has replaced his Windows Phone with an Android phone. They can’t as Intel has already warned Microsoft about any x86 emulation. Amd managed to reverse engineer x86 40 years ago with a fraction of the resources…time to break the monopoly.